The old respected name of Senneh is synonymous with valuable Oriental carpets. Thus the Persian knot is also known as the Senneh knot even though it is hardly used here. Today this town, which was proclaimed the capital of the Kurds by Shah Nadir in the 18 th century and is famous throughout the carpet world, is known as Sanandaj. Senneh and Bijar are both major Kurdish centers in which no authentically Kurdish carpets were woven. 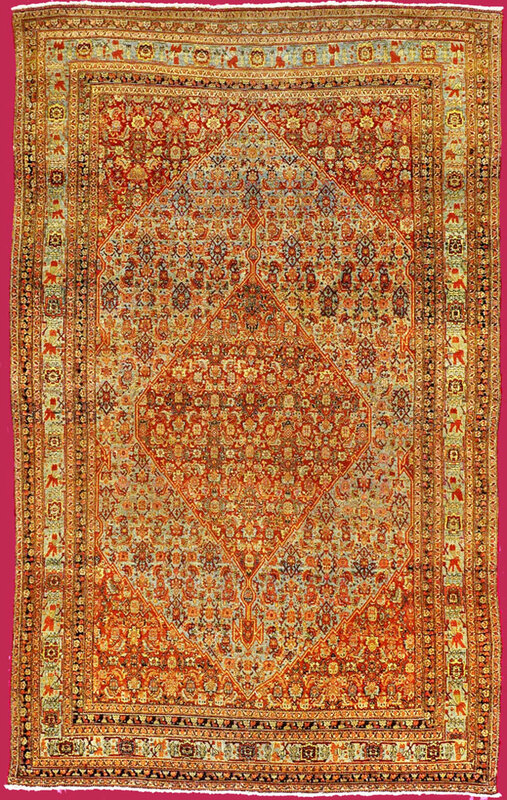 It is probably true that in Senneh some of the finest knotted carpets of old Persia were woven, and the weaving tradition was preserved for centuries. This applies not only to fineness of weave and special weaving techniques, but also to the development of the designs and interpretation of patterns and ornaments borrowed from many other carpet weaving areas and cultures, as for example the Herati pattern or the perennial boteh symbol, amongst others. Senneh products stand at the pinnacle of Persian carpet art because of the precision of drawing and of knotting, the range and harmony of their colours and the artistic composition of the designs in the field, corners and borders.